Venturis operate on a principle of differential pressure. Water flowing into the venturi at a pressure much higher than that of the venturi itself causes a vacuum. This vacuum causes air, ozone or liquids to be sucked into the main water stream in higher quantities. In short, the higher the water pressure feeding into the venturi, the higher the volume of injection the venturi delivers. A correctly sized and installed venturi can achieve a gas/water ratio of 1:1. (i.e. inject 1L of air/ozone into every 1L of water passing through it). Venturis come in a number of different sizes. A venturi's size is determined by the pressure and flow rate of the water and not size of the pipeline it is installed on. Which Venturi do I need? Mazzei venturi injectors are available in a variety of sizes ranging from ½ inch to 12 inch pipe diameter. 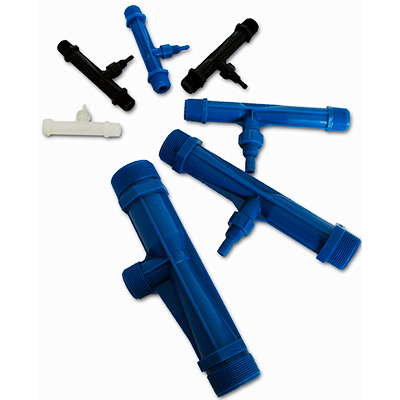 Wassertec keeps stock of a number of models, A number of models ranging from the ½ inch to the 3 inch are kept in stock permanently, with other sizes available on request. Mazzei venturi injectors are engineered from highly chemically resistant Kynar(PVDF) making them extremley durable and chemical resistant. Venturi performance is an important factor to consider when purchasing a venturi injector. The venturi performance table below will assist you in choosing the right venturi for your needs. You can also contact us for advice on sizing and installation. • 287 1.1 to 5.25 66 to 315 3.15 1/2 "
• 384 2.5 to 12.6 150 to 756 7.60 1/2"
• 484 3.2 to 23.5 192 to 1410 12.3 3/4"
• 584 10.6 to 39.7 636 to 2382 22.8 3/4"
• 684 15.1 to 57.2 906 to 3432 38.6 3/4"
• 784 16.3 to 80.0 978 to 4800 51.6 3/4"
• 978 17.0 to 87.1 1020 to 5226 49.2 1"
• 1078 30.3 to 106.7 1818 to 6402 62.1 1"
• 1583 53.8 to 213 3228 to 12,780 123 1 1/2"
• 1584 74.9 to 367 4494 to 22,020 217 1 1/2"
• 2081 184 to 598 11,040 to 35,880 375 2"